Vista Talks, one of my blogs, talks about software, tips and tricks for Windows Operating System, was previously excluded in Google Search Results and now it is back into Google Search Results. We received a request from a site owner to reconsider how we index the following site: http://www.vistatalks.net/. Previously there is no reply from Google when Google has reviewed and re-included your site in their search results. 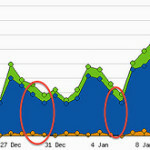 The new Google Webmaster Tools now seems put more attention on their users’ requests.